The Pentagon said Thursday that it would ease some restrictions on women serving in combat roles, a step that in part codifies the reality on the ground in Afghanistan, where commanders have stretched rules to allow women to support ground combat units. After a long-delayed review that had been ordered by Congress, the Defense Department said it would open about 14,000 combat-related positions that women had previously been excluded from -- but would continue to prohibit them from serving in 238,000 other slots, nearly all of them in the Army and Marine Corps, as well as special operations forces. The changes will take effect in spring unless lawmakers intervene. 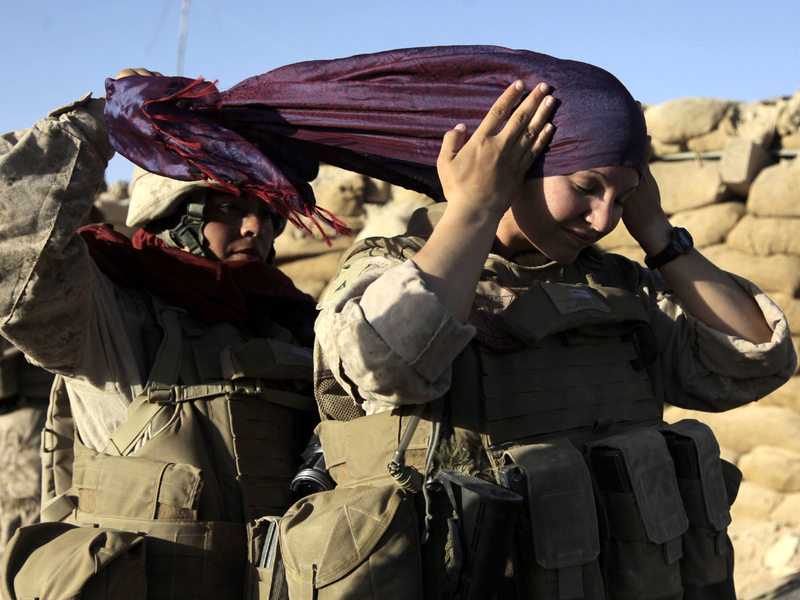 Some advocacy groups for women in the military criticized the Pentagon for moving too slowly and for only belatedly recognizing the critical role that female troops have played in the wars in Afghanistan and Iraq. "It's a tiny step," said Anu Bhagwati, a former Marine captain who is now executive director of the Service Women's Action Network. "It's a bit of a slap in the face. We're already doing this stuff." Since 2001, about 280,000 women have deployed to Iraq and Afghanistan, according to Defense Department statistics; 144 have been killed and 865 have been wounded. Congress has been prodding the Pentagon to review its 1994 policy that prohibits women from serving in units whose primary mission is "direct" ground combat, such as artillery, infantry and tank companies. In March, a congressional commission recommended that a long-standing ban on women serving in ground-combat units be overturned as part of a broader effort to bring greater diversity to the armed forces, particularly in the officer ranks. Congress separately ordered the Defense Department to review the ban and submit its own recommendations. That review was due last April, but the Pentagon took an extra 10 months to complete it. Part of the reason for the delay was that the military was in the midst of another big social change: the repeal of the "don't ask, don't tell" policy that prevented gay troops from serving openly. That ban was lifted in September. Women in the Army and Marine Corps face the most job restrictions, with each service prohibiting them from serving in about a third of its positions. In contrast, the Air Force excludes women from only 1 percent of its positions, while the Navy places about 12 percent of its jobs off-limits, many of them aboard submarines. The Navy, however, began permitting female officers to serve on subs last year. The Pentagon review found no evidence that the existing job exclusions limited career advancement for women, contrary to assertions from some advocacy groups and members of Congress. Women comprise about 14 percent of the active-duty military, but only about 7 percent of the roster of generals and admirals. The armed forces have been making gradual progress on that front. The Air Force this month nominated Janet C. Wolfenbarger, a commander at Wright-Patterson Air Force Base, to become its first female four-star general. Last year, the Marine Corps assigned Brig. Gen. Loretta E. Reynolds to become the first female commanding officer of its iconic recruiting depot on Parris Island, S.C. Some senior commanders have said it is only a matter of time before the military lowers barriers to women even more. Last month, the vice chief of the Army, Gen. Peter Chiarelli, told The Post on the eve of his retirement that banning women from combat jobs in the military was an unnecessary anachronism. Chiarelli said the Army should set clear physical standards for combat jobs and then require men and women to meet them. "There is this mistaken belief that somehow through prohibiting women in combat jobs we can protect them," he said. "I would rather have standards that we apply across the board."